Frank's Redhot Beef Jerky is a product of Thanasi Foods, LLC, out of Boulder, CO. Thanasi specializes in extending popular food brands into other markets. 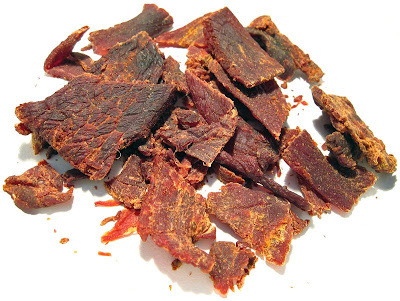 This beef jerky is an example, taking the popular Frank's Redhot cayenne pepper sauce and extending it into beef jerky. Thanasi was also the company behind Jim Beam Beef Jerky, Vlasic Dill Pickle Sunflower Seeds, and Stubb's Bar-B-Q Sauce Beef Brisket Strips. In addition to this original variety of Frank's Redhot Beef Jerky, Thanasi also offers a "Chile 'n Lime" variety. This particular review sample I have was manufactured by Jerky Snack Brands, out of their Mankato, MN facility. Frank's Redhot Beef Jerky is difficult to find. It's official website shows a list of gas stations carrying this, but when I visited the few in my area, none was carrying it. Amazon.com only had a few left when I placed an order. Beef, water, Frank's Redhot Original Cayenne Pepper Sauce, brown sugar, sugar, salt, hydrolyzed soy protein, spices, red pepper, garlic powder, sodium erythorbate, sodium nitrite. The tastes I pick up from the surface of these pieces is a slight sweet, a slight pepper sauce flavor, a bit of salt. In the chewing, I can pick up more of the pepper sauce, a tanginess, a bit more saltiness. My initial thoughts is that this jerky isn't quite what I had hoped it would be. I kept envisioning pieces of meat brimming with the vinegary pepper sauce, and giving me a serious mouth burn. I mean, the graphics on the package is perhaps one of the most effective I've seen, with its red-orange background and its fiery yellow explosion. It makes me think this stuff is really hot. But it really isn't quite that. As for tasting like Frank's Redhot Sauce, I'd say this jerky does indeed live up to this flavor, perhaps in a moderate amount. I can taste the vinegar, which I think produces the tanginess I described above, and I can taste the cayenne pepper in the sauce. It's all easily noticeable, and easily enjoyable. But it doesn't attack my senses the way the package graphics has me believing. I'm left feeling teased, instead of fully satisfied. It certainly does leave a burn in my mouth, but on my hot scale it's like a medium. On an individual piece basis, I don't get any burn at all. It's only after eating several pieces that a burn gets built up. I don't, however, taste any natural meat flavors. The garlic mentioned in the ingredients is barely noticeable. I think the vinegar and cayenne pepper in the sauce masks it out. 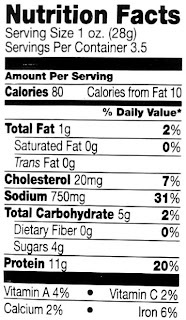 The level of salt intensity seems light, despite the high 750mg of sodium mentioned in the nutrition label. That too might be masked over by the sauce. 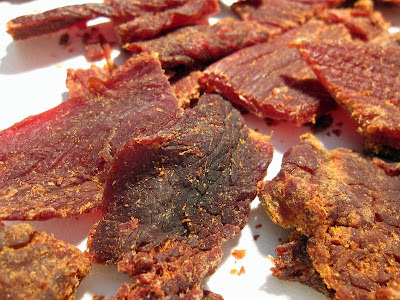 Overall, the dominant flavor of this jerky is the Frank's Redhot Sauce, mostly as a tangy vinegar taste, and the cayenne pepper highlights. I don't see any other flavor component as having a dominating presence. These appear to be slices of whole meat, sliced to a medium thickness, and in small to medium sized pieces. I'll note that there's probably a full ounce of crumbled bits in the bottom of the bag. It's largely a dry jerky with a few pieces feeling a bit more moist. The larger pieces seem fairly easy to tear apart with my fingers, and overall the jerky seems easy to chew. The chewing texture has a fibrous, meaty quality to it. It's somewhat like chewing a real steak, but more like well-done, and dry. There's a tad bit of mushiness to it, and some pieces are more chewy than others, but overall it seems to have a steak-like chew to it. I'm finding tiny particles of jerky on my desk and on my lap, but only a few. I'm not picking up any residue on my fingers. I don't really see any visible bits or streaks of fat on this jerky, and no tendon or gristle. But several pieces did leave behind some wads of unchewable membranous tissues. I purchased this 3.5 ounce package from Amazon.com, which sold this in a quantity of 3 packages for a price of $15.33. Amazon waived the shipping fee because I opted for slower delivery, and also because my total order included several other items. All in all, it worked out to a price of $1.46 per ounce, which puts this in the average price range. For general jerky snacking purposes, at this price, I think it provides a good value. I do find this to have a moderate level of snackability, a decent chewing texture, and it's easy to eat. As being advertised as a Frank's Redhot Sauce variety, I think it's a good value also. I'm definitely getting the taste of Frank's Redhot Sauce, though not as much as I would have liked, but it's still easily recognizable and enjoyable. Frank's Redhot Beef Jerky seems to provide an average amount of snackability for me, and that's good enough to get it to an average rating. I don't necessarily see this jerky as above average in terms of taste. It gives me the flavor of Frank's Redhot Sauce, but it doesn't really knock it out of the ballpark. I wanted more flavor, more vinegar taste, more cayenne pepper, more hot. Instead it seems to be toned down to suit mass appeal. Everything else about this jerky seems like typical mass-market stuff. There's no natural meat flavors. The consistency is on par with the Obertos and Jack Link's of the world. The chewing texture is actually better than what I'm accustomed to seeing from Jerky Snack Brands. It may just be this particular lot, I don't know. My recommended beer pairing for this jerky is a brown ale. What is wrong with you? Have you no viable taste buds?! All the flavors you say it lacks I taste definitively. Maybe you got an old batch or something or you need to cleanse your palette?